Excellent Southern and eastern exposure on this highly usable 5.76 acres, zoned for horses! Views of Pikes Peak from the front deck, living/dining room and kitchen. Views to the North of Crystal Peak, line of sight to Mt. Pisgah, for high speed internet. 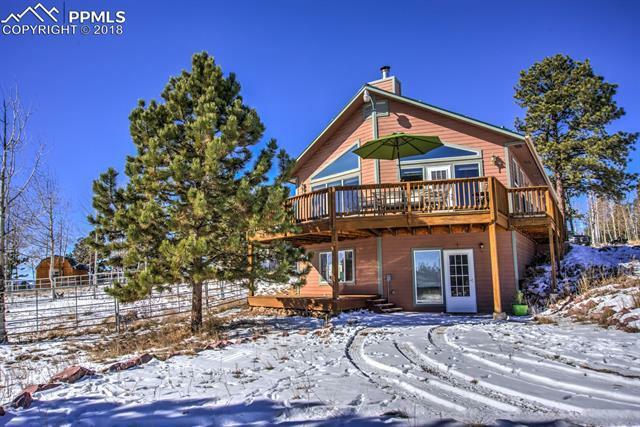 Located only 35 minutes West from Woodland Park, and minutes to trophy trout fishing in Eleven Mile Canyon, 30 minutes to local reservoirs. Great room design, w/ open kitchen, dining room, & living areas, overlooking the majestic Pikes Peak views through a wall of glass.